Having an advance directive can be extremely beneficial, as it allows you to specify your wishes while easing the decision-making burden on your loved ones. 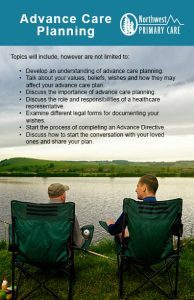 Advance directives can provide clear guidance to health care providers, reduce the likelihood of a dispute with and among family members and ensure you avoid unwanted procedures. It is a very good idea to make sure your doctor(s) know your wishes and has the latest copy of your advance directive on file. Classes are currently being held in our clinics. For dates, times, and locations please see the listings under Classes. Call 503.659.4988 to attend the class.